Scientific name: green or true cardamom – Elettaria cardamomum, black cardamom – Amomum subulatum. Cardamom is native to India, where it is considered the most prized spice after saffron. It is also widely grown and used in countries such as Sri Lanka, India, Nepal, Indonesia, Guatemala and Tanzania. The pods can be used whole, or the husks can be removed to release the seeds. Cardamom has a slightly pungent and very aromatic taste. They come in three varieties: green, white and black (or brown). The green and white pods can be used for both sweet and savoury dishes, curries, or to flavor rice. Black (or brown) pods are usually used only for savory dishes. Limonene and cineole are terpenes with great anti-cancer properties. Cineole is also widely found in other herbs and fruits like rosemary and citruses, and studies indicate it can improve cognitive function. Quercetin is anti-inflammatory, anti-oxidative, and anti-allergic. A few studies also suggest that quercetin may improve physical performance. Linalyl acetate and linalool are major components of cardamom’s essential oil, and both are powerful anti-inflammatory phytochemicals. Cardamom has been widely used since ancient times in India, Nepal, and neighboring regions for its outstanding aromatic properties. Having a pungent smell and a delicious taste, this spice is a traditional component of many eastern dishes and drinks, as well as a natural breath-freshener with a fabulous bonus—instead of just masking the bad breath caused by oral bacteria, cardamom actually kills them and gets rid of the cause itself. The antiseptic potential of cardamom has been confirmed in dozens of studies, particularly against such bacteria like Staphylococcus aureus, Streptococcus mutans, fungi similar to Candida albicans, and even yeasts of the Saccharomyces type. All of these mentioned bugs are believed to play a crucial role in the development of oral cavities, so that’s a huge bonus for cardamom’s breath freshening action! Anti-inflammatory and antioxidative action: Studies indicate that taking about 3 grams of cardamom daily is enough to effectively reduce the amount of inflammation molecules in the body and significantly boost its anti-oxidative effectiveness. Prevents obesity and improves glucose intolerance: Animal studies show that daily cardamom supplementation significantly reduces the accumulation of body fat, improves glucose metabolism in the body, and reduces free radical damage to the liver. Reduces anxiety and alleviates depression: Quercetin, one of cardamom’s main phytonutrients, was proven to have antidepressant-like effects in animal studies. Effectively reduces blood pressure: Taking 3 grams of cardamom powder daily significantly reduces both systolic and diastolic blood pressure, as well as boosts the blood fibrinolytic (clot-dissolving) activity. Both effects are just fabulous for decreasing cardiovascular risk! 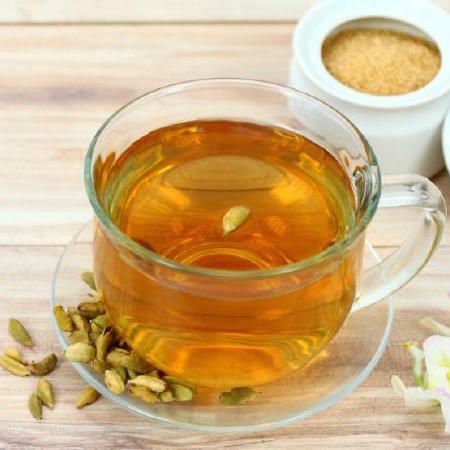 Protects the stomach and heals ulcers: Drinking cardamom tea helps to stimulate a healthy stomach acid secretion that helps in complete digestion and assimilation of ingested food. It prevents constipation and digestive disorders. Studies indicate that all forms of cardamom-containing substances (extracts, essential oils, etc.) have great potential against gastric lesions. In some cases, cardamom extracts were shown to work better than conventional anti-ulcer medications. Protects the liver and heart from free radicals: Animal studies confirmed that black cardamom increased antioxidant activity in the liver and heart, indicating that this spice is likely to reduce free radical damage to these vital organs. Fights cancer on multiple levels: Damage to the DNA of the cells is a major risk factor for future mutations and tumors. 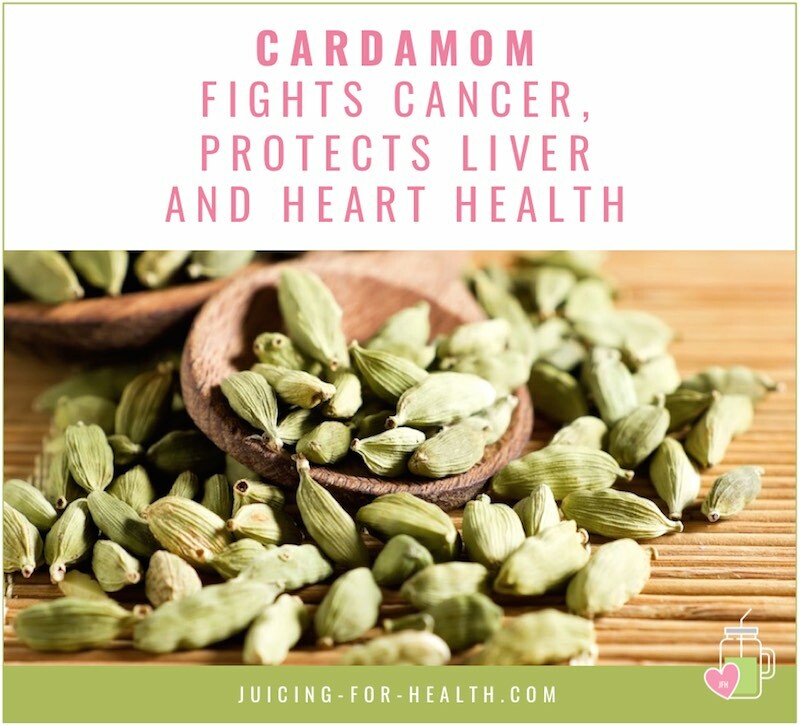 Cardamom is able to decrease DNA damage caused by free radicals and increase the activity of the body’s natural killers (special immune cells that kill tumor cells). Has anti-asthma potential: A major component of bronchial asthma is the episodic narrowing of the bronchi, making it harder to breathe in. Animal studies have confirmed that the phytochemicals present in cardamom are able to block calcium ion channels in the trachea and bronchi, resulting in the relaxation and widening of these structures. Altogether this results in a solid anti-asthma effect! Relieves spasms and relaxes muscles: The active compounds of cardamom were reported to have significant antispasmodic effects in several animal studies, most likely due to their ability to block muscarinic receptors. This means that cardamom oil and extracts are likely to relieve such conditions like stomach cramps! Fights flu effectively: Cardamom contains high levels of potent antioxidants, is antiviral, antibacterial, antimicrobial, anti-inflammatory and has immunomodulatory properties. These medicinal virtues make cardamom an excellent spice to be used for treating a cold, sore throat, cough, microbial infections and allergies by strengthening your immunity. Drinking cardamom tea is beneficial for reducing the severity of inflammatory conditions such as asthma, bronchitis and pneumonia. Bonus: In 2010, an interesting study revealed that cardamom-flavored chewing gums effectively reduced nicotine withdrawal symptoms in people who recently had quit smoking. It’s quite likely that cardamom seeds would have a similar effect! 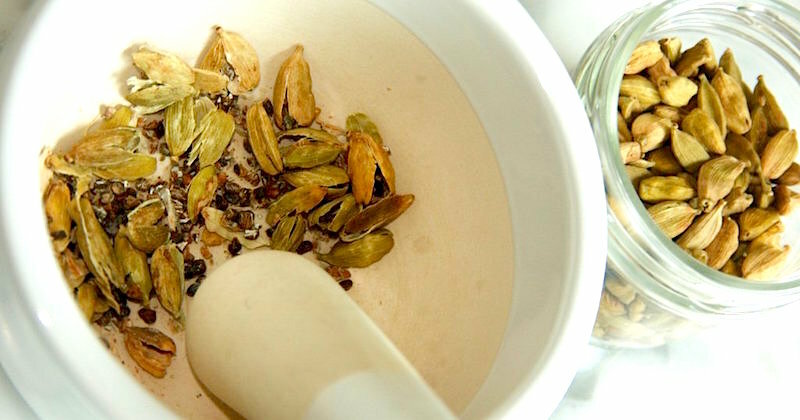 Cardamom is highly versatile in terms of how you can take it. Some people like to add it to their coffee or tea, others use it to spice up their meals or just take the seeds throughout the day to keep their breath fresh. If you plan to use a cardamom extract instead of the powder or dried seeds, follow the instructions provided by the manufacturer and never exceed the recommended dosage. The active components of cardamom seeds help flush out toxic wastes circulating in your bloodstream. Drinking cardamom tea regularly helps eliminate free radicals, pathogens, infections and heavy metal ions from your body. Due to its mild diuretic properties, it is also helpful in reducing bloating and water retention in your body. Drinking this tea around the “time of the month” helps reduce PMS symptoms. Put all the ingredients into a stainless steel pot with 3 cups of water. Bring the contents to a boil, then simmer for about 3 minutes. Turn off heat. Strain the tea into your teapot or teacups and discard the spices. Let cool to just warm, add raw honey as desired for taste. There are no studies on the matter of cardamom’s safety during pregnancy and lactation, so those are two relative contraindications. Cardamom is a blood thinner—it increases the blood effectiveness in dissolving clots. Now, while this is good for heart’s health, it may be dangerous for those people who are already taking anti-platelet and anticoagulant medications. There were several reports indicating that cardamom may increase the risk of bleeding when taken along with other prescription blood thinners like warfarin. There are no available studies on the matter of cardamom toxicity, so the spice is considered to be fairly safe to take.